Logins this hour: 3166 ? Spiral Software's history begins back in 1986. A (then) young man named Stuart Karon finished his Masters degree in computer science at Brown University and took a job at MIT Lincoln Laboratory. A few months into the job, he began writing a fast, simple-to-use graphing program to help Lab researchers plot and analyze data. A year later, Laboratory staff began using EasyPlot and over the next two years, EasyPlot grew and became very popular. In 1989, Stuart licensed his EasyPlot software from MIT and founded Spiral Software. For eight years, Stuart enhanced EasyPlot while overseeing Spiral's marketing and sales operations. In 1997, Stuart handed the sales and marketing of EasyPlot to another company. Free of marketing concerns, Stuart had time to watch his wife, Jodi, fill his desk with papers and eraser shavings. Jodi was assembling call schedules for her pediatric residency program. Like chief residents around the country, she had only primitive tools to aid her task. Call scheduling for a single month consumed around ten hours of her time. Stuart sensed Jodi's silent plea for help and began working on software that would make call scheduling easier. Six months later, Jodi began using OnCall, the AMiON scheduler. In a few more months, it had all the features she needed. She quickly completed the call schedules for the balance of the year and had more time to devote to medicine and resident training. Jodi finished her chief year and is a practicing pediatrician but Stuart continued adding new features to AMiON. By 1999 the software had matured to handle any size or type of residency program and Stuart started a web-publishing service at Amion.com where staff could view their schedules online. In 2001, Stuart began tailoring AMiON for attending groups and hospitalists. 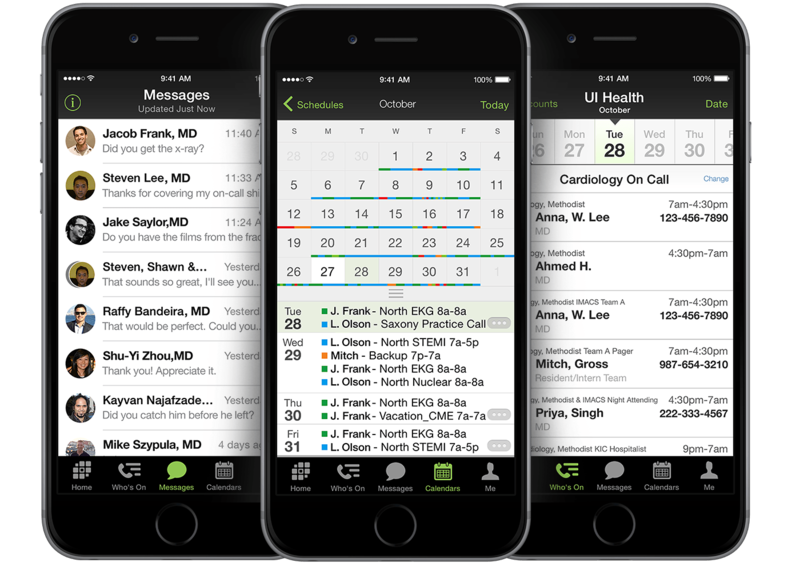 In 2003, Spiral Software produced a hospital-wide contact system with a central on-call list built direct from department schedules. By 2008, Spiral built up training and support services with new staff and expanded AMiON for Enterprises with switchboard tools to help manage last-minute changes and sign-outs, search functions for finding on-call staff, and much more. Throughout the years, we've done our best to be personally available. Call and a person picks up the phone. Email and you get a timely reply. We did little to reach out to people using AMiON, though. Through 2009, we quietly built new online databases for managing information at AMiON, including web pages (such as the one you're reading now), help documentation, news postings, and lists of those who use AMiON. In 2010 we built a more dynamic and informative web site, including usage statistics such as the number of people who log in to view schedules each hour. In 2011 we partnered with Doximity to develop the Amion Mobile App which led to secure messaging via Amion in 2014. In 2017 we launched Amion Concierge. Thanks to all of you who use AMiON! We look forward to many years of helping people with schedules.